Stamping T-shirts has officially become an obsession around here. We featured T-shirts and onesies for the little guys last time, but today’s post is all about the “big kids”! Lindee and I are always imagining new paint and stamp combinations to try. Lately, I have been really loving retro fruit patterns! 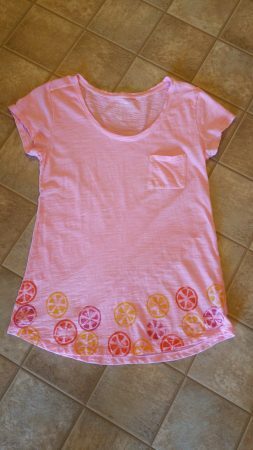 In this post, I style my fruity T’s as I head out on some spring adventures! Let’s start with the supplies I used to stamp the shirts! I will buy fruit-shaped foam stamps whenever I find them, but I also make my own. 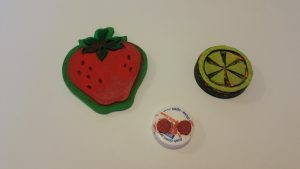 The citrus slice and cherry stamp are my own creations! Check out my Funny Bunny Scarf post (here) to see how to make your own stamp. 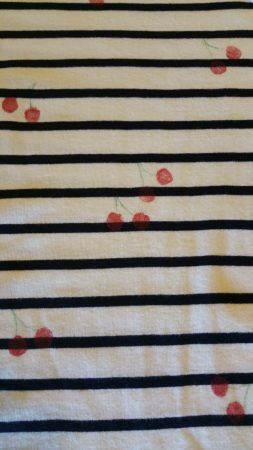 The cherry stamp was one of the easiest to make, since it consists of two small circles. After painting, I draw on stems with a fabric pen. For step-by-step instructions on stamping the shirts, check out last week’s tutorial (here) on stamped tops for babies and kids! 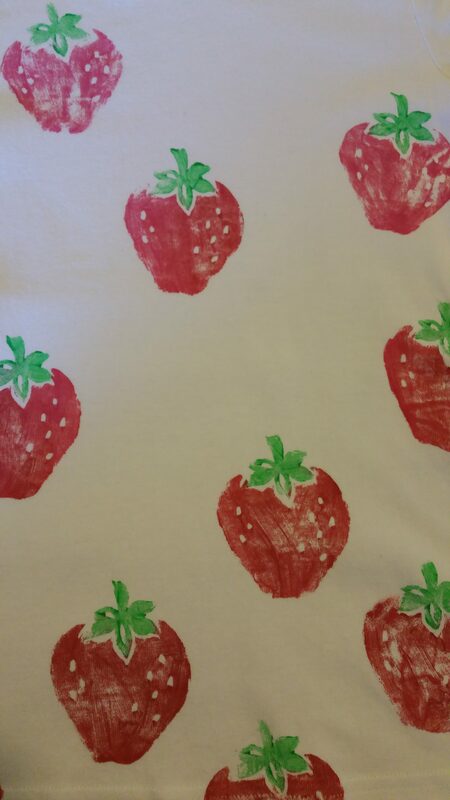 Here are three finished shirts I painted for myself, each featuring a different fruit stamp! First up is the citrus slice! 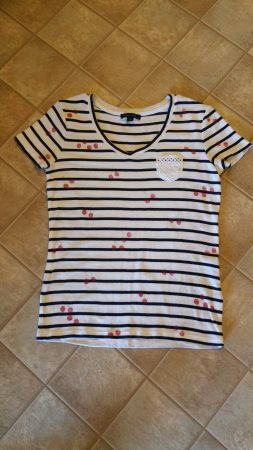 And lastly, here are the little cherries stamped over a striped shirt. I used a green fabric pen to draw on the stems. 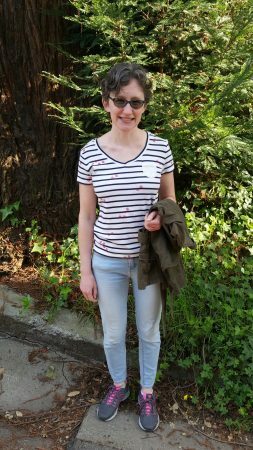 I wore my stamped shirts during a week of gorgeous spring weather! 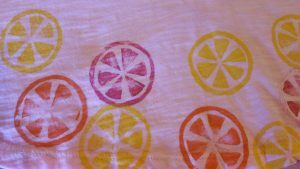 The citrus shirt accompanied me on a cheese-shopping mission with Cute Hubby. We enjoyed the super views and yummy samples (here) at Bohemian Creamery! Despite the helpful samples, it took us a while to make our cheesy choice! 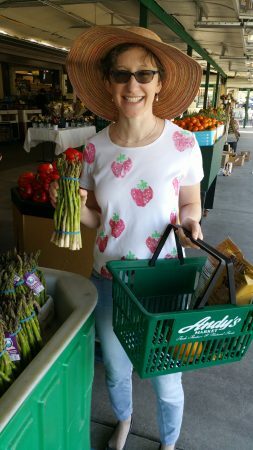 Our local favorite, Andy’s Market, was the perfect spot to pick out fruits and veggies to coordinate with my shirt! Spring = Yum! 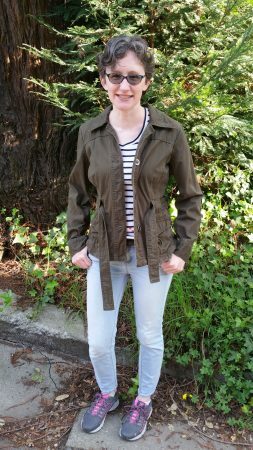 I took my cherry T on an evening walk. New green leaves and spring flowers were everywhere! 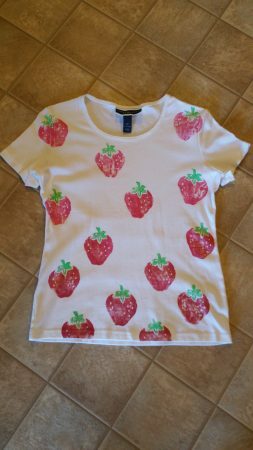 I love my fruit T’s, but I am already thinking of new stamping combinations to try… Stay tuned for more ideas soon! Hope you get inspired to try your own!